You may have noted a comment by Charles Freeman. Well, we just have to disagree on the reality of the human blood. I am an independent scholar, formerly a Senior Examiner of the International Baccalaureate;s critical thinking programme, Theory of Knowledge, and thus used to looking at evidence or asking those who know. I had the Heller/Adler papers read by a professor emeritus of physiology who said that their claims that this was blood were totally unconvincing. I show the bloodstains to any forensic expert i can find and they all say they have never seen dried blood that red. So I am not working on the understanding that this is blood. Why can’t the STURP tests be replicated 37 years on? Have they lost the tapes??? 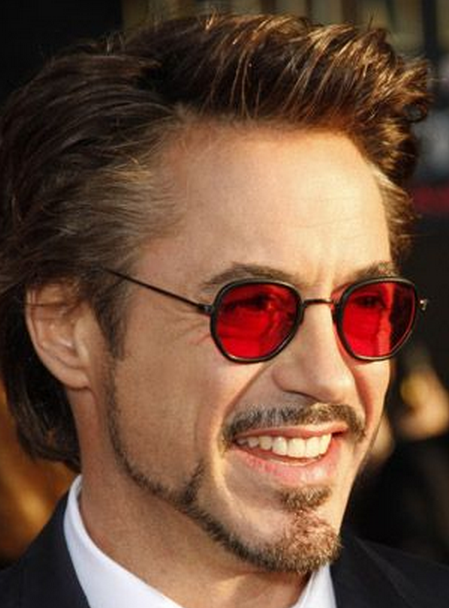 Caption: Robert Downey Jr. telling Charles Freeman that everything looks too red. Will we ever learn the name of any of Charles’ many experts du jour. But that isn’t the point. The point is that Charles is playing the blood-is-too-red card, perhaps too carelessly, something that Colin Berry in one of his overly long, topic-drift postings picked up on. In fact, Colin, is challenging the very notion that the blood is too red. Er, which photograph(s) of the TS show the blood as "too red"? How come after 3 years of looking at TS photographs, I have yet to see them? It can’t be the 1931 Enrie photographs, since they are B/W. It can’t be the 2002 Durante pictures, at least those that appear on Mario Latendresse’s Shroud Scope, since the colour of the blood in those pictures is scarcely distinguishable from the body image, the entire look being a dull plum. Durante 2002 (from Shroud Scope): blood too red? (The first thing I do with Shroud Scope pictures is put then into MS Office Picture Manager and adjust brightness/contrast/midtone from 0,0,0 to -7/100/15 in order to get the blood looking redder). So which photos are Charles Freeman showing to his buttonholed experts? Maybe those Halta pictures on the iPad app, recently described (aptly methinks) as mere toys? Or maybe the BBC’s earlier release in 2008 of Halta pictures that do show a rosy hue in places where it’s not expected, but in prominent areas of body image, not blood especially. Halta image from BBC site (2008). Some pink coloration – but it’s mainly in the beard and other body-image locations. Finally, let’s not forget the Turin custodians’ own site with a selection of TS views, essentially the same it would appear as those on Shroud Scope.No, the bloodstains do not look too red. Indeed, they do not look red at all. Misleading impression of ‘redness’ created by high magnification/strong illumination? RGB reference standards for comparison? Might the colours also have been digitally adjusted in a manner that accentuated redness? That still leaves unanswered the question as to which photograph Charles Freeman showed to his forensic experts or emeritus professor of physiology. I shan’t bother asking him directly. I’ve wasted too much time already – putting innumerable points and questions to someone who persistently displays a blissful indifference to the hard facts – and getting back nothing useful in return. Remember the fun days? Anyone remember Let’s Talk Red Blood: Bilirubin, Saponaria officinalis and UV? All those other people believing the blood is too red. Colin wasn’t questioning it then, was he? From his very look at an actual small fragment of blood he discerned in his labs high-powered microscope with different mode of viewing, Heller describes what he saw as bright red. Adler later concurred. Explaining the bright red color was a challenge but they believed that it was the result of the torture Christ endured releasing bilirubin into the blood stream. They did not offer off the cuff anonymous opinions. They checked their findings with associates and received confirmation. They used multispectral analysis down to the nanogram level. They published in a peer review journal. NONE of the photographs taken of the Shroud are fine definition enough to visualize that level. Various people have commented the the blood has an unexpected redness, not just Heller and Adler, but, more relevantly those who have seen the Shroud under different lighting conditions. Some have said that the blood looks “fresh” as if the redness were witness to a miracle, or to a pathological state (not as yet demonstrated), and others say that the redness is merely witness to the blood not being blood at all, but paint. Some say that the blood could have been real blood, but given its freshness with a bit of paint on top. Some observers suggest that the blood looks pinker in daylight than it does inside, which may be due to the different spectra of the illumination, or due to fluorescence derived from the sunlight, not achievable using artificial light. Miller and Pellicori’s fluorecence tests do not confirm this suggestion. My own observations on Shroud 2.0 are that the blood does look too pink to be nothing but blood, regardless of any speculations about bilirubin, methemoglobin etc. But then, it also looks too pink to be iron oxide. It does look like red madder. The identification of blood rests largely on Heller and Adler’s positive tests for porphyrins, both chemically and spectroscopically, and also bilidenes, via a conventional test kit. It has been pointed out that porphyrins are present in other materials such as chlorophyll and urine, but the field is definitely narrowed to a fairly small range of possibilities, including actual blood. My experts will be acknowledged in any academic articles I write, but so far there has been a consistent assessment that this is not dried blood. There is no reason to believe that it is blood until the tests on Shroud samples are replicated in a forensic laboratory. …..but I don’t have access to the STURP tapes. Most of the STURP tapes were sent back to Turin after Adler’s death by his widow.. In any case, after McCrone, Rogers, Adler etc., these poor remains are useless. Yes, the blood on the Shroud is “too red”. Yes the color of the blood strongly depends on lighting etc. But, as a general rule, it is too red. Nevertheless, it is human blood. The identification of blood rests on Heller and Adler’s tests (not only porphyrin, Hugh, but also many other tests for the other components of blood, including immunology) AND P.B. Bollone’s tests as well. Do you really think that it could be rose madder? Mc Crone himself found some rose madder dye but never said that it is related to the blood. It is not iron oxide and it is not rose madder. It is real human blood but too red. We simply do not know why. I felt that Colin’s inserted picture of Kim Kardashian (a few weeks back) was too red, but perhaps he used MS Office Picture Manager…..
Colin Berry is not seeing red, he is not seeing bilirubin either. Although the bile pigments of animals arise in all probability from the catabolism of heme precursors, there is evidence that bilirubin, accompanied by iron salts, promotes the synthesis of new hemoglobin when injected into humans, dogs, or rabbits suffering from secondary anemia. Etc, etc, etc …. …. I would conclude that chlorophyll comprises porphyrins attached to a Magnesium atom. Hemoglobin comprises porphins attached to an Iron atom. Bilins are non-metallic porphyrins. The first time I heard about the too red blood was through Barrie Schwortz saying that for him it was the last big issue. He presumably had as much photographic evidence as well as that from personal observation to be sure of his facts. I thought it odd that he was persuaded by one test when presumably like the rest of us he could have asked any forensic expert what they thought- or at least got a second opinion. If then bloodstains are two thousand years old ,as some appear to believe, then it is sad that they survived on the Shroud for two thousand years and were then lost by STURP within thirty. I don’t that’s fair on STuRP, do you? The fragments of the Shroud did not belong to them, and were not lost; they were returned to their owner. Nothing wrong with that. Thibault, above has referred to some findings by Baime Bollone. These findings were made by using fragments that were removed from the Shroud by vacuuming, were kept illicitly, and tested without permission. As far as I know the subsequent owners of the Shroud do not acknowledge them. I was approached on Tuesday by a TV producer who wanted to know about the history of the Shroud. Naturally I told them to get Beldon Scott and master that before going any further. If it was history that they were after I would be happy to help further. What would one say ,if asked, which I was not, was the status of the STURP tapes which as you will all know were a representative cross section from different parts of the Shroud image and non-image areas. From the above we can learn that the total sample may have been broken up with some parts going back to Turin but that after MCCrone, Rogers, Adler, etc, had worked on them they were useless and so presumably were not available for replication of the original tests. No Hugh. Bollone’s findings were based on several pieces of threads (yes threads, mostly from the bloodstains,not only fibers!) taken by him during the night of 9 October 1978, just before the beginning of STURP’s work. Obviously this was planed and made with the authorization of Gonella and Ballestrero in the presence of the STURP members, Gonella and Max Frei. Bollone’s work on these fragments were of course authorized. In fact, given the sampling method, Bollone had much more material (blood) than STURP. Both teams (STURP and Bollone et al. ), using different methods, obtained the same final result: it is blood beyond doubt. Gosh. I didn’t know that. While STuRP had nothing but a few fibres sucked off the surface, Baima Bollone was able to cut away whole threads? And nobody in STuRP even mentioned this? Curious. That there was antipathy between members of the STURP team and Ballone is well documented. Ballone and the Turin Confraternity resented the intrusion of the Americans into what the regarded as their monopoly. Here’s a freebie from my book. “Less than a week before the scheduled departure for Turin, Centro di Sindonologia cabled D’Muhala asking him to send the twelve hour protocol. D’Muhala immediately called Jumper and asked him what to do about the cable. Jumper replied: “The hell with it. Send them our ninety-six hour protocol, and we will argue it out when we get there.” It ought to have been clear to the American scientists by this time, that they were facing a good deal of political intrigue in Turin and that many in the Centro were virulently anti-American and resented the intrusion of the Americans. It also appeared that there were those in Turin and the Vatican who were welcoming the American initiative. The issue would be decided on the ground in Turin. “On September 28, the sudden death of Pope John Paul I added a whole new complexity to their situation. “The following day the STURP team embarked at Kennedy Airport for Turin. To have gotten as far as they did, in as good shape as they did, was a virtual miracle. It was also a combination of hard work, brilliant organization and a collaboration of some of the finest scientific minds in the world. In the UK, the talents of David Rolfe and Ian Wilson had contributed to the impetus for their mission by dramatizing their quest. Clearly, Frs. Rinaldi and Otterbein had found allies in Turin and the Vatican. Just as clearly were those there who wished them ill and resented the American intrusion into their world. “So, as their plane roared down the JFK runway, lifted into the air and tucked its landing gear away, no one could know with any surety what awaited them across the sea and whether they might not be totally frustrated in their endeavor. Maybe God knew although more than one member of the STURP team harbored doubts about whether He existed at all. Read John’s answer. It’s the truth. Also read the extraordinary book of Heller: “Report on the Shroud of Turin” , 1983. I have it in French. Please purchase this book: it’s a must! This book is the incredible adventure of STURP from the beginning (you will see how serious was the preparation of the whole work). What I wrote above is entirely described in this book (and confirmed in several papers of Bollone). You will also understand the many conflicts between STURP and the Centro (at the time in the hands of Bollone). I agree with Thibault: Buy John’s book. It is very informative. Dan, in the old days Colin wasn’t questioning it. I think you’ve already portrayed Colin Berry as Don Quixote tilting at a windmill, he’s not Don Quixote, he’s the windmill. Thought for the day. Anti-authenticists seems as far away as ever from convincingly explaining the Shroud image, Colin’s interesting experiments and ideas not withstanding. Thought for tomorrow. So are authenticists. I don’t think so. To validate any claim of anti-authenticity, it is necessary to postulate a credible craft process to achieve all the properties of the image. That does not look like succeeding any time soon, despite all the efforts being made to achieve it. The authenticist can claim it was an unknown natural process, or else a miracle, neither of which are admissible by the anti-authenticist. Daveb- as numerous specialists have pointed out to me, a full size cloth from the ancient world would be so much rarer a survival than one from the medieval world ( which is rare enough to be of interest in itself) and so the onus is on the authenticists to prove their case rather than the other way round. Have you read the fascinating paper on Palestine textiles by the organic materials specialist from the Bari Conference – one of the nine they published? It seems to have been overlooked here and even includes a reference to a much later example of the Flury-Lemberg stitch. Christians did not give spiritual power to and collect relics before the fourth century, there were hundreds of thousands of medieval relics so a relic first recorded in the medieval period is more likely to be of that period. It only needs one expert associated with linen conservation to give specialist support to the idea that this is a linen discoloured by having had gesso and paint on it for several centuries before these disintegrated. Then we would have a solid working hypothesis. I am working on it but would prefer to publish in a recognised specialist textile journal with a specialist co-writer to give me wider credibility. Meanwhile the balance of probability is overwhelmingly against the survival of such a large cloth over two thousand years unless it had been in a tomb in Egypt. If it had been first century, we would have had some excited textile specialists crawling over a unique three-in-one herringbone weave , not otherwise known until third century silk damasks, of this size. This is why I like the Bari paper which sets things into perspective. The painting theory is garbage. The image is clearly based on contact with a bodily form – either a real body or a statue / bas relief. I’m open to non-authenticity arguments but painting is not one of them. If you properly inform yourself of shroyd literature charles then you would reach tgat view. I should think that if I were in the position of Dr Freeman, I should be concerned at the likely adverse effect on my professional reputation than “to publish in a recognised specialist textile journal”, an hypothesis which so contradicts what is scientifically known about the nature of the image, a superficial oxidation limited to the crowns of the threads, reducible by diimide, the absence of any signs of painting whatsoever, a realistic image of a human corpse which lacks any artistic precursor, with no evidence of any similar artifact, and an hypothesis which lacks the slightest support of any scientific corroboration and lacking any intent to research the same. Claiming it was caused by an unknown natural process is not a whole lot more convincing than an unknown artificial one, but I agree that a miracle is an option for the authenticists but not for the non-authenticist. “Non-authenticists” not “Anti-authenticists.” There are many of the former, but, I hope, very few of the latter. I should be curious in knowing what both Hugh and Charles make of the pattern of water stains that predate the 1532 fire, and analysed by Aldo Guerreschi which he presented on British TV in 2004, and his explanation that it is consistent with accordian folds and stored in an earthenware jar as were the Dead Sea scrolls which also happened to survive a similar efflux of time. There is no known record of the TS being stored in such a way post-dating 1355. However I would not doubt that either of them would be capable of dreaming up some alternative self-satisfying scenario. Hi Mr Farey – Everything depend on whether you believe in resurrection or not. If you believe in resurrection, then it is a unknown process to human beings and also the creating of an image on the Shroud is also and unknown process to human beings. If you are not believing in resurrection then the creation of the image is a forgery to human beings. That why Mr Freeman and his experts think it is a painting. Also controversial Carbon dating supports views of Mr. Farey and Mr. Freeman. But most of the Shroud researches proved that image on the Shroud is not a painting. I think Aldo Guerreschi was a major influence on my interest in the Shroud, in that he took perfectly clear and obvious marks that everybody had unthinkingly associated with the 1532 scorch marks and demonstrated incontrovertibly that they were no such thing. Since then, as you know, I have attempted to track every finding about the Shroud which “everybody knows” back to its primary source, often to discover that it wasn’t anything like as clear to the scientist who discovered it as it is to his readers and adherents. I do have a copy of Heller’s book and think it gives a wonderful feeling for the atmosphere and activities of the STuRP team, although a little embroidered for the sake of keeping the story alive. However he does not mention Baima Bollone at all. Belief in the resurrection is irrelevant to the Shroud. Resurrection theology has moved on a long way from attempts to explain the physics of the empty tomb – which Pope Benedict referred to almost contemptuously as “the mere resuscitation of a corpse” – to what it was that enabled the early church to gain such a foothold in European culture. That’s not to say that there could not have been a miracle, just that it is not necessary for belief in the resurrection or the foundation of the church. Sorry that’s gobbly gook Hugh. miracle not necessary for belief in the resurrection? True, I guess, if you believe in the resurrection in a metaphorical sense. But I think the NT is pretty strong testament to the resurrection being much more than metaphorical (although it obviously encompasses meaning). Sampath is right – if you believe in the resurrection as a literal event then it is perfectly conceivable that the Shroud image would have been created by that event. I am of course indebted to Heller’s book. However, the same person who steered me to Heller’s book and who was a member of the STURP team told me the story of Ballone and his antipathy. I don’t choose to reveal my source but it’s a source I trust. One of the good things that has happened recently is the leadership role now being played by Bruno Barberis at Turin Centro. At one conference he held STURP as a model for future examinations of the Shroud but a “STURP” with true international membership..
OK, but you did not answer to the question of Dave. Where are you going now ? Thanks for the link, Hugh. The author is a reactionary and makes use of the fact that Benedict did not express himself clearly. Hi Louis. Your last paragraph, referring to Meier and Benedict XVI, puts the theological position accurately. Apart from the theologically valid but unscientific statements about the fullness of God and pointing beyond history, your key sentence is “That is a reasonable explanation without the need to go into details.” You will find Benedict’s position very well set out in Chapter Nine of his ‘Jesus of Nazareth: Holy Week’ and a somewhat sour condemnation of his theology by Donald Sanborne at http://www.traditionalmass.org/images/articles/RazResArt.pdf. I have read the Sanborne article. Does the reactionary philosophy that Donald Sanborne espoused in that article reflect your view of Catholicism? That’s not an idle or impertinent question. So do I, if the concept of the soul is not illuminated by the issues of the quantum nature of intelligence and consciousness. Sanborne seems to be essentially what I identify as a fundamentalist Protestant ethic – we are saved by faith alone. That leads to a certain intellectual arrogance: the authenticity of the Shroud is not an important issue because I have “faith” and don’t need it to be authentic. The authenticity of the Shroud is important because it is a Revelation that gives physical substance to the Gospel accounts. In age where we have advanced so far in Science to be knocking on the door of the nature of consciousness and its survival as a part of the quantum information of the Universe, that is no small thing. One thing, in my opinion, the Gospels make clear: We are saved by love, but that’s another debate. “Does the reactionary philosophy that Donald Sanborne espoused in that article reflect your view of Catholicism?” No, it doesn’t. I’m with Benedict XVI., not Pius X.
Phew. It would be hard to teach physics otherwise. Glad we are on the same page on that score. Hugh. the interviews Benedict XVI gave to Peter Seewald, former editor of “Der Spiegel” and ex-communist, are worthwhile reading. The pontiff refused to see any questions in advance and the blunt-spoken Seewald regained his Catholic faith. I think it’s fair to say that most of the popes were all men of their age and attempted to deal with the problems of the universal church of their time as best they could. That was the case with St Pius X, and for that matter all those who came after him. However that is not to say that everything a pope has to say on any such matter is necessarily infallible. I have before me from my youth an old battered soft-cover copy of “The Papal Encyclicals in their Historical Context” written by Anne Fremantle in 1958, which I still value for its content. In the early 1900s, sound doctrine was in peril as a result of a movement within the Church which sought to follow the extremes of a certain German Protestant trend which saw much of the New Testament as mythology. Certainly there is mythical content there, but Christianity is founded on definite historical events, centred on the life, death and resurrection of Jesus Christ, and its saving power for humanity. The response of Pius X was to issue his encyclical “Pascendi Dominici Gregis” in Sept 1907, condemning what he called “Modernism” and which included a list of proscribed propositions. Reviewing Pascendi now in the 21st century, a few of these propositions now appear quaint, of no great moment, and seem to be from another age which has now passed. The reforms of the Second Vatican Council of the 1960s, which sought to make the Church more relevant to its presence in the world, seemed to pose a threat to those of an ultra-conservative mind, who sought to freeze the expression of belief and practice in a single moment of time, that which prevailed from a past age. Out of this we saw such movements as the St Pius X society, the Lefebvre movement, a dogmatic attachment to the old Tridentine rite, a refusal to acknowledge the validity of any subsequent popes, and various other signs, which saw any advance from the 1900s as pure heresy. Thus Donald Sanborne condemns Pope Benedict XVI as a modernist, disrespectfully calling him “Ratzinger” with little acknowledgement of his proper religious title. It is a nasty little piece of polemical writing. This is notwithstanding that many of us can recall Cardinal Ratzinger in his role as head of a doctrinal congregation as seemingly extremely conservative in his care for sound doctrine, as demonstrated in his treatment of such writers as Hans Kung for instance. As Pope Benedict XVI, he reached out to those who had fallen away under the Lefebvre spell, and sought to reincorporate them into the universal church. Small thanks he had for it if we are to judge from such writings as those of Donald Sanborne, who would seem to prefer a church confined to the irrelevance of a past age, with no real witness for Christ in the present world. 1 Corinthians 15: “And that he was buried, and that he rose again the third day, according to the scriptures:  And that he was seen by Cephas; and after that by the eleven. Then he was seen by more than five hundred brethren at once: of whom many remain until this present…  After that, he was seen by James, then by all the apostles. .
 Now if Christ be preached, that he arose again from the dead, how do some among you say, that there is no resurrection of the dead? But if there be no resurrection of the dead, then Christ is not risen again. And if Christ be not risen again, then is our preaching vain, and your faith is also vain. “Then the Italian contingent went to work. Whole threads were removed from the image and blood stained areas, leaving visible marks behind. Jackson winced, for everything we had planned was non-destructive.” Presumably Heller wrote in English, so I wonder how Bollone got mentioned in the French translation. Where am I going? I’m not sure. Throughout STuRP literature, the minutest details of investigations into microscopic fragments are covered in intense detail, while the finding of “the Italians”, who appear to have had orders of magnitude more to work on, with much more definitive results, are almost entirely ignored, their authors being grudgingly admitted to a list of references rather than highlighted in the text. Why is this? Heller makes little secret of his contempt for Italian scientists “who had no idea what X-ray fluorescence was.” Did STuRP put no faith in Baima Bollone’s findings? Were they justified in doing so? I don’t know. Like you, I don’t understand the difference between the original American Edition of Heller’s book (1983) and the 1985 authorized French translation. This is amazing! Nevertheless, there is no doubt that “the Italian contingent” means Baima Bollone and his team. May be Barrie could confirm that. No “vacuuming”, not “kept illicitly” and not “tested without permission”. Whatever the personality of Baima Bollone, his work is worthy of consideration. Because at the time (1978 and later), the Centro (Baima Bollone and co-workers) considered the TS as its own property. Moreover, Baima Bollone never published his findings in peer-reviewed journals but only in the journal of the Centro. The whole context explains the attitude of STURP. It was not a scientific problem but a “political” problem. Knowing that, what do we have to do now? In my opinion, to look at both STURP’s and Bollone’s findings. The final result is clear: the “blood” on the Shroud is truly human/primate blood. I have always thought that on the whole Heller and Adler’s experiments were sufficient to persuade me that the blood was actually blood, in spite of one or two distinct anomalies. I didn’t appreciate Baima Bollone’s work, principally on the basis of the lack of STuRP’s enthusiasm, and am still concerned that such little respect was made to his findings by the Americans, considering he had so much more to work on. I was told that a book by Dr. P-L Baima Bollone was published last month. In one Shroud article I wrote he was mentioned as having dated the Sudarium of Oviedo to the seventh century. Apparently that was a mistake because no details about how he proceeded are known, but then the dating is cited in só many articles on the topic, including one on the Shroud by Prof. A.Danin. Without access to new studies of the shroud itself, shroud ‘science’ (whether pro or con authenticity) is becoming little more than farce. David- I am sure we all hope the the Pope might authorise a new examination of the Shroud which would,in the spirit of the 1973-6 examination ( the findings of which tend to get overlooked) actually include people who deal with the weaving and conservation of ancient textiles. STURP ‘s greatest failing was to assume, without any examination of the matter, that the images on the Shroud now are as they have always been, seven hundred or two thousand years ago( for obvious reasons the further back you date the Shroud the more likely it is that the images were originally different from what they are now). Yet there is much that can be done without revisiting the Shroud itself. The Shroud is exceptionally well documented and there are many early depictions of it by a variety of engravers, painters, etc. We can assemble a database of all these for specialists to pore over at their leisure. With work on painted linens continuing apace, there is also a lot to be done on bringing together all the new research and examples to see how they might illuminate features of the Shroud. It was through this kind of research that the dating of the Horses of St. Mark’s was finally authoritatively settled. No one could dismiss the evidence of similar dated gilding on copper. Yet, a new close-up examination of the Shroud itself would be best of all. Over to you, pope Francis. I am interested in the Baima’s theories but I will not buy one of his books. I have other priorities. Baima’s books are not in the librairies of my university (neither in the Theological faculty). Is there any way to consult one of them at least? The book by Dr.P.-Luigi Baime Bollone was published last month, but it is in Italian. Bom dia, Louis, I have asked other thing and I am not Portuguese. Thank you anyway. I wrote in Portuguese, which is not very different from Spanish, only because you saíd sometime ago that you were not sure about yout English and that Spanish was your native language. Reblogged this on Best of Shroud Story.